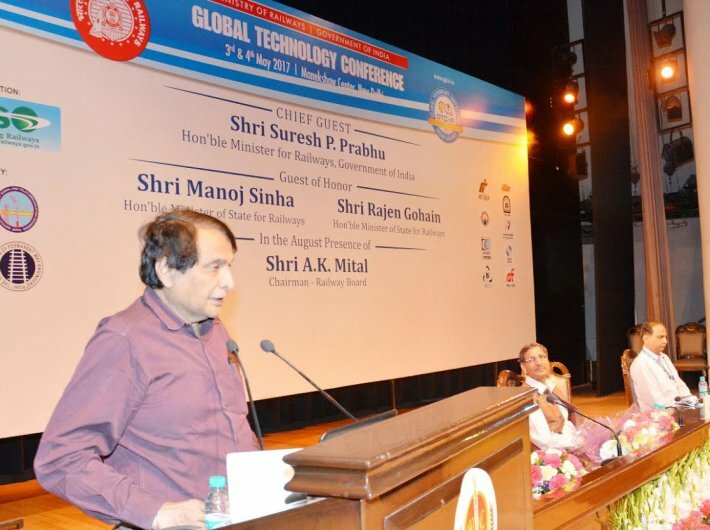 Railway minister Suresh Prabhu has urged global technology players to come forward to co-develop technologies with India. “India is not just another destination where we can import technology and use them,” Prabhu said while inaugurating Research Designs and Standards Origanisation’s (RDSO) international conclave on Global Technology Conference in New Delhi. Prabhu said India offers good opportunities to international firms to co-develop technologies for the railways. “Global firms should try to develop cutting edge technologies with their Indian counterpart, (whether it is) private or government entities. India is a big market for the global suppliers of technology at the same time it is important to understand that make in India is one part and develop in India is another,” the minister said on Thursday. He admitted that Indian Railways lagged behind in the race of modernisation because of lack of investment. He, however, said that now the railways has stepped up investments and is having a clear cut five year roadmap. “I am optimistic that in these five years we would invest over $140 billion. We should try to put in $300 billion into the railways (over the next 10 years). There is a plan of investing around $450 billion in the next 15 years into the railways to expect huge transformation in the Indian Railways at par with global railways,” Prabhu said. He laid emphasis on exploiting cutting edge technology and modernising the railways for the betterment of rail users. He said that railways across the world are upgrading themselves and evolving which should prompt Indian Railways to learn such modern technologies and use them for day to day operations. “RDSO will have to ensure that the railways adopt cutting edge technologies in the shortest possible time. We must set some deadlines to conclude how we should proceed about it,” he said. “Look at the seriousness of the Indian Railways in implementing new reforms and therefore, the global players should try to co-develop technologies,” he added. The conference covered issues like enhanced safety, reduced in-service failures and automated Health monitoring & Inspection, capacity enhancement and congestion reduction and enhanced customer service. Over 50 speakers from India and abroad gave their presentations on various subjects. Railway board chairman A K Mital spoke of how Indian Railways lagged behind other developed countries due to lack of technology development and implementation. “Indian Railways came into being around 165 years back. The technology available with the Indian Railways at that time was almost of the same standard as was available in abroad. But, now we have lagged behind substantially behind other developed countries. There have been changes in the Indian Railways but those have been marginal. We used to have tie-ups with foreign collaborators to develop technology, but the pace was very slow,” Mital said.